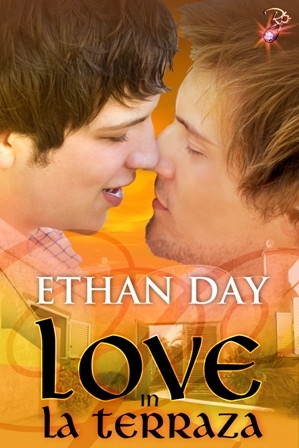 I currently write mainly contemporary gay romance, mostly romantic comedy, but I’m venturing out into other sub-genres like mystery and paranormal, with a little time travel mixed in. Absolutely not. A good writer is a good writer. That’s like telling an actor who is gay in real life that they’re incapable of convincingly playing a heterosexual role. It’s just silly to me. The biggest key to writers block is not to stress over it when it does come around. I avoid the stress by not contracting books before they’re finished. If I have no due date, I have nothing to wig-out over when I do get stuck. Walking away from the writing every now and then is usually the best medicine for me: veg’ing out with a book, movie, spending a weekend on the couch with Netflix and TV series marathon, chatting with friends online, on the phone or in person–basically anything that takes me out of that writers head space for a while. Gosh, that’s really difficult to say. I think for me, the best marketing has been things I don’t really consider marketing, like GRL. I realize part of the reason I’m there is to promote myself as an author, but for the most part it’s not something that feels like work to me. I’ve always been a bit of a social creature and writing is a very solitary occupation, so getting away from the computer and spending time with people who enjoy the same things I do seems more like a reward or a really cool perk. Not much, who has the frickin’ time!?! I can barely squeeze in any writing of my own at the moment. I don’t really think I try to measure my success. It’s kind of pointless to a degree as there really is no central reporting of sales data, so it’s impossible to ever truly know where I sit when compared to others. As long as I enjoy what I do and can make a living doing it, I’d consider that success. What is your favourite drink? Diet Coke and wine – red, white, hell…even pink! If it comes from a grape and it has alcohol in it, I’ll drink it! Are you a cat or dog person? I’m an equal opportunity pet lover, though I am allergic to cats so that takes some of the fun out of it, but they chase imaginary bugs up the wall…how cool is that!?! I have a dog now, a Yorkie, but she’s more hypoallergenic as Yorkie’s have hair and not fur. She’s adorable and she totally rules the roost. If you could spend the day with any famous author, who would it be? And, why? Absolutely none of them! I already know all about what they do…boring! Give me a hunky marine, an astronaut, or a cat burglar…a nice one that won’t like kill me or anything. That sounds way more interesting. If you could indulge free of any consequences, what would be your ultimate sexual fantasy? If I could indulge free of any consequences, I’d wish to be able to eat as much chocolate as I wanted and never get fat. I can’t think of anything sexual that I’d want to do that I wouldn’t do if given the opportunity, lol. Cain Elliott is a desperate man – on the brink of losing La Terraza, the 1920’s Spanish style courtyard apartment complex his grandmother left him in her will, he’s faced with the option of selling to a real estate developer or losing the building outright, due to the costs of upkeep that have now left him teetering on the brink of bankruptcy. On the partnership fast-track at the flashy architectural firm of Hamilton-Bach, Henry Abrams is new in town, a little lonely and looking for inspiration. Tired of games and longing for something real, Henry discovers the road to happiness could lie in the arms of the sad, uncomplicated Cain Elliott. Discovering that Hamilton-Bach represents the mysterious entrepreneur attempting to purchase La Terraza, combined with the self-doubt and mistrust over a love that develops too fast, leave both men struggling to decide whether or not they can truly find…Love in La Terraza. Cain felt the heat flush his cheeks the instant Eddie had said it. “Abrams. Henry Abrams,” he said, extending his hand before noticing the white folding cane in Eddie’s hand. Cain thought he was kinda cute, standing there slightly awkward for a moment as he tried to decide what to do with his hand now that it was already out there. He tossed Henry a lifeline by taking it instead, shaking his hand. “May I sit?” Henry asked as everyone said their goodbyes to Eddie and Matt who scurried off into the crowd, whispering to one another. “Please,” Nic said, smiling as if she were Cain’s self-appointed social director, having completely missed the cues Eddie had thrown down like gas on an already flaming forest fire. Cain could tell Stu had not but wasn’t quite able to figure out a subtle way to tell his wife they were now intruding upon and likely impeding the sacred homo mating dance. “So what is it you do, Henry?” Nic asked. Cain could tell she was wired up and ready to play Debbie Drill Sergeant, already commencing with the interrogation. Henry started to answer, but Cain dreamily placed two fingertips over the man’s lips. Henry’s forehead crinkled, as if he were thinking real hard about whether or not he liked where this was going. His playful half smile told Cain he was still amused if nothing else. Henry blushed, but he started to laugh. Cain could tell the man knew he was at least half joking for the benefit of their audience across the table. “Well, what if he’s a serial killer or something?” Nic asked, visibly disgusted with Cain. Nic started to object then must’ve realized Cain had a point. “You aren’t a serial killer, right?” Cain muttered out of the corner of his mouth. “Not even if I beg you to?” Cain asked. I have a thing for special houses. LOL on the lust or love choice! I loved this story, every character, your writing. Sooo good! Thank you for stopping by, everyone!